Shine like a diamond. Get delicious lips with Lipgloss Long-Lasting and shine the whole day long. A formula for deep hydration and a plumping effect. 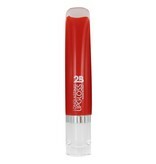 This lip gloss has intens colors and a medium coverage. Formulated without parabens. Strawberry Sorbet, Raspberry Sorbet, Water Melon Sorbet or Red Berry Sorbet. Which one do you prefer?